The Spirit of Mother Earth? To give a little background, at the time I was Christian, and had stopped smoking weed about 1 year prior because of my beliefs. I also had been going to a charismatic church for over a year and a half, so I was starting to get familiar with seeing visions during worship, and communicating with God telepathically, which is basically the same as channeling my Higher Self. Although I decided to stop using drugs some time ago because of my beliefs, as I continued to develop my own relationship with God and gain my own insights, I was starting to understand that perhaps certain plant medicines aren’t really that bad, and they actually may be very beneficial. I had been reading a bit about DMT, so I decided I’d like to use it someday, but at this point I had no idea how I’d go about getting it, so I just prayed about it and asked God to give me an opportunity to use DMT. Major synchronicity! Within a matter of days after that prayer, one of my friends who I hardly ever talk to, just “randomly” messages me, saying one of her friends is having an open Ayahuasca ceremony, and I’m free to come if I’d like. I was BEYOND happy! Like, how does that even happen?! Leading up to the ceremony, I read online about the “Ayahuasca diet”, so I decided to follow it very closely and cut certain foods out during this time. I had already been vegan for about six months at this point, and for the few days leading up to the ceremony I basically just became a raw vegan, and on the very day of the ceremony I had nothing but water. When it came time for the ceremony, I drove to the location and made myself comfortable. There were about 20-30 people gathered around a campfire, and we all just made small talk until it was time to partake. They had brewed the Ayahuasca and poured it into a gallon jug, so we all had to pass it around and share. They explained that as each person receives the jug, they should speak their intention for the ceremony, and breathe it into the Ayahuasca by blowing into it, and then swirl it around before drinking a mouthful. When it came time for me to drink, I wasn’t sure what to say for my intention, so I asked for “spiritual enlightenment”. I took a mouthful and swallowed, and as soon as I did, I felt something powerful in my spirit, but wasn’t sure what had just happened. I think it may have activated my third eye, but at this moment it just felt like something happened, but I had no idea what it was. It just felt like some sort of “shift” energetically. Within a few minutes I started thinking that I could feel some slight effects, but wasn’t completely sure. At one moment I just sort of “shook out” my hands, and it was really weird because it seemed like the “hands” of my spirit body actually CAME OUT of my physical body! Sort of like pulling your arm out of a sleeve, but I just noticed it for a brief moment. At this point I was actually getting a little annoyed with the group of people I was with, because everyone was talking and wanting to socialize, but I just wanted to focus on the spiritual stuff I’m about to experience, so I just pulled out my ipod and put on some worship music. Usually I get more in-tune with the spirit realm and see visions when I worship, so I decided this would be a great time to do so. I just put on some music from Bethel church, which is one of my favorite bands. About 30 minutes in, I started to feel nauseous. I closed my eyes, and in my mind, very faintly, I could see colorful geometric patterns. They looked very bright and sparkly, but it still seemed like a very faint vision in my mind. As time went on, the nausea continued to get worse, but I remember reading online that singing can actually help relieve the nausea, so I decided to try it. Instead of actually singing though, I used a little meditation technique I learned, which stimulates the third eye. I call it “purring” because basically you just make a purring sound like a cat. When you do this, you can feel the vibrations going through your brain, and it stimulates the pineal gland. The vocal activity of “purring” also has a similar effect to singing, and I noticed the nausea starting to feel better. After a while, I started to get really giggly, and just started laughing for no reason. At one particular moment I felt very strongly in my spirit that Ayahuasca is REALLY powerful, and I actually started to get nervous that this is going to be more overwhelming than I expected, so I just asked Ayahuasca to go easy on me because it’s my first time, haha. Around this time I was starting to feel REALLY cold. One of the effects of the MAOI (the thing in Ayahuasca that allows your body to absorb the DMT), is that it causes your body to react in a way that you get cold. I think it has something to do with blood constriction or something, but I don’t know exactly how to explain it. Even with the blankets I had and the campfire nearby, I was still REALLY cold, like bone chilling cold, so I decided to get up and go to my car so I could turn the heater on full blast. About an hour and 40 minutes in, I started to really feel the effects. 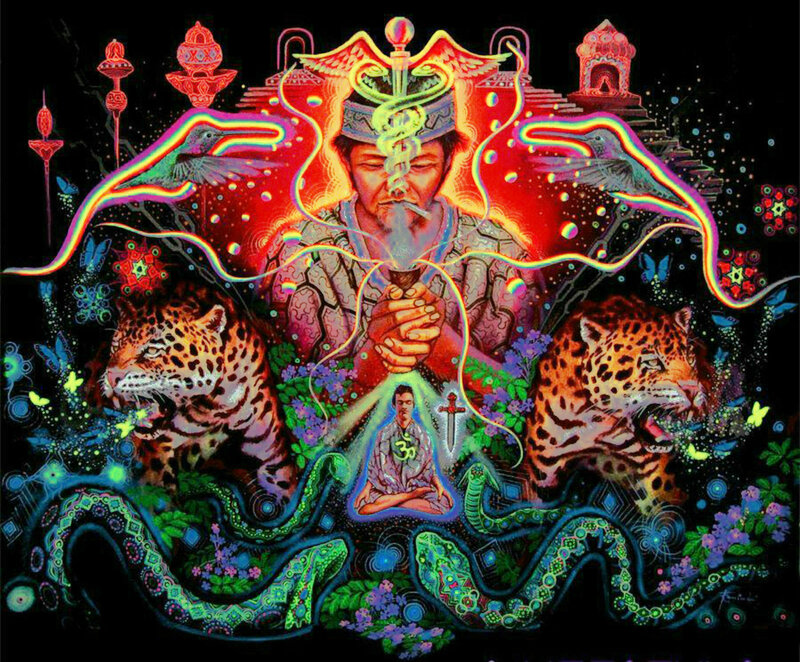 The spirit of Ayahuasca speaks to me in the same way God speaks to me, which is to telepathically place its thoughts in my mind, in a way that feels like I’m just “thinking” about something random. It feels like a very subtle thought in my mind. It felt super inviting and gentle, like a mom, just inviting me to let go, and don’t be ashamed to let whatever happens, happen. I decided not to resist at all, so I said, “Yeah, okay”, and opened my car door to vomit on the ground. I thought to myself that in doing this without resisting, I’m actually letting go of pride. Pride will tell you that you’re vulnerable and weak if you “give in” and purge. Purging is actually a GOOD thing! I felt the stomach acid burn as it came up, but it also felt like I was releasing a lot of negative energy. After purging, I felt MUCH better, and wasn’t nauseous anymore. Now the conversation with Aya started. She told me to turn off the music so she can talk to me. I started getting super nervous all of a sudden, and wanted to avoid answering the question because I know I don’t have a good relationship with my dad, but I could feel it resonating so strongly in my mind I knew I couldn’t avoid facing it. She then told me that this is only lesson one, and it’s essential that I learn this foundational principle if we are ever going to move on to the other lessons. Through this conversation, she led me to understand that it’s actually okay that I hate my dad. I always thought this was something to be ashamed of, like I’m a bad person for hating my own dad, but here Ayahuasca helped me realize that if my dad did something to me, and treated me in a way that CAUSED me to hate him, there is no shame in admitting to how I feel! Every emotion you experience is completely valid, and you have every right to feel the way that you feel! Throughout the conversation I also realized, the way she speaks to me is completely profound. It seems like she already knows the answer to the questions she asks, but she wants me to find it for myself, so she will continually lead me through a series of questions, leading me directly to the answer in a way that feels like I already knew it. There was a moment when Ayahuasca told me to worship her. This freaked me out a little because I was Christian and I thought it was wrong to worship anyone other than God, so she is here trying to deceive me and get me to worship her. She went on to explain something, which I had just learned a few weeks ago, which is that “worship” is just when you acknowledge the beauty in something. For example, I worship God by telling him that he is holy, he is my peace, he is my strength, he is my wisdom, he is sovereign, etc. Worship is basically just declaring who God is. It’s simply to acknowledge his attributes. This means you can basically worship anything, by simply acknowledging the attributes of how God created it. For example you can acknowledge the beauty in nature, and say how beautiful a tree or a flower is, and in doing so you are actually doing the exact same thing as what “worship” really is. It’s simply to acknowledge the attributes you see in something, and declare WHAT it is. In doing this though, God actually gets the honor, because he is the one who CREATED the beautiful thing I’m admiring. It’s not as if acknowledging the beauty in a tree is to go “against” God, because God is the one who created that tree. Everything in creation is created by God, so no matter what you decide to “worship”, the true honor is still going to God because he is the one who created it in the first place. This means I can “worship” Ayahuasca by telling her that she is a good teacher, she’s really amazing, etc, and in doing so, God still gets the honor because he is the one who created her. What this all boils down to, is to say that you are actually supposed to honor, and even celebrate, everything you encounter, because no matter what you are looking at or dealing with, it was all created by God, so when you celebrate what you’re looking at, you are simultaneously celebrating the one who created it in the first place. This is the truest form of worship to God – to celebrate everything that he created. At this point I felt in my spirit like I was coming to a brink. I was actually about to “worship” someone other than God. I’d thought for my entire Christian life that this was wrong, but I could feel this revelation resonating so deeply I could not deny that it was true. I knew that if I believe this, the natural byproduct of that is for me to express it, and actually DO what I just learned. Other Christians would perhaps say this is the moment of my biggest fall. The moment when I “worship” someone other than God. In truth it was actually not my biggest fall, but rather, my biggest breakthrough! I am finally FREE!! I simply told Aya that she is awesome, and she is a REALLY good teacher. By saying that, I worshiped her. She is created by God, and it’s good that I’m acknowledging the beauty he put in her. To continue in this train of thought, I was suddenly reminded of a revelation I’d just received a few weeks ago while I was worshiping. The answer I got was, “I created you.” You are the result of the creator of the universe, creating his very best work. When God created you, he actually created himself. You are an extension of God. You are God. You literally are made in the image of God, because you are a REFLECTION of God. So as I was being reminded of this revelation I had already received a few weeks prior, Aya brought it to my attention again, showing me that I need to “worship” (celebrate/give honor to) everything in creation, because everything is a reflection of God. By honoring everything, I am simultaneously honoring every aspect of God. In grasping this revelation, I realized there is no longer any need for religion. You can find God in everything, because he created everything. There is no one religion that is better, or has all the answers, over the others. The way I see it, it’s like looking at different land masses across the planet. Each place expresses the environment in a different way (hot, cold, rainforest, mountain, etc) but they are all just different expressions of the same planet. Religion is the same way, each reflecting a different aspect of Divinity. Each one expresses a different aspect of God’s beauty, and no one is better than the others. They are all part of God’s creation. After all of this, it was time for a break, so Ayahuasca told me to turn the music back on, she wants to see me worship. I put on some more worship music, and in my mind I could see Jesus dancing, haha. He was wearing a white robe, with a beautiful colorful part on the edge. As I watched him dance, it seemed like he was just showing off his glory, and it looked really beautiful. Next, Ayahuasca told me “victimless crimes” are not wrong. There really wasn’t a whole lot of explanation because it just “clicked” with me instantly, and I realized it really doesn’t make sense that there are laws against using PLANTS, especially when you’re not even bothering anyone. Also, I used to be super homophobic when I was Christian, and especially because my parents always talked bad about gay people. In this moment I suddenly realized there is really no reason to have any hatred or judgement toward homosexuals, because they are just living in a way that makes them happy, and what gives me the right to stop them? Continuing in this line of thought, literally nothing you do is “wrong” because as an aspect of God, you have every right to do what pleases you. You have never made a single mistake in your entire life, because every time that you decided to do something, whether it was “good” or “bad”, you must have had a DAMN good reason for choosing what you did, and God will always honor your perspective. This ceremony took place overnight, and as it was getting pretty late now, I was starting to fall asleep. Aya told me to eat a few breath mints to help me stay awake. At first I started thinking I shouldn’t eat any because some of the info I read online says not to eat sugar as part of the preparation diet, but Aya reminded me that I’m actually talking to HER right now, so what’s happening in our conversation can overrule anything I read online. Even if there are certain things I’m not “supposed” to eat, she basically just canceled out that rule and made an exception this one time because I needed help staying awake. She let me know that it would not interrupt the ceremony. After eating a few breath mints I realized Ayahuasca really is a SPIRIT that you interact with, and not just a chemical that causes a physiological process to happen in the brain. If it were merely physical, the effects could be negated if you eat anything on the deferred list, but since it’s actually a spirit, you can literally talk to her and make certain changes based on the circumstances. After journaling and relaxing for a while, I decided I was ready to go back to the group at the campfire, because it was now 6am and people were starting to leave. At this point it had been 5 hours, because we drank the brew at 1am. When I got back to the campfire, something very interesting happened. There was one guy who was talking a lot, so I thought to myself, “he’s talking too much”, and immediately he said outloud, “No, I’m not talking to much.” Haha, I immediately recognized that he must have been able to hear my thoughts. I just kept thinking to myself that this experience has been so mindblowing I just want to soak it all in and try to process everything, but the people in this group were all talking too much, so I just decided I’d try to socialize with them for now, and process everything later. I had a moment where I started to realize how judgmental I am of people. I started thinking to myself that even though these people here seem to be way more spiritually advanced than me, I was shocked that they still smoke cigarettes and eat junk food. I was just thinking that they didn’t even do the ceremony correctly because they ate breakfast immediately afterward, and it’s always recommended that you don’t eat right way after the ceremony because the “after-glow” is the most important part, and you will continue to receive insights if you’re not distracted. If all you did here was drink the brew, but then go straight back into your normal life immediately, like going back to eating junk food (they were eating donuts), and you’re talking the whole time and don’t take time to integrate, it’s like all you did was use the ceremony to get high or see a cool light show, but you really miss out on the most important part of integrating the Ayahuasca experience. It’s like you didn’t really learn anything. After realizing how judgmental I’m being here, I understood that I really can’t judge anyone at all. Just because a person has had SOME spiritual experiences doesn’t mean that they’re automatically in a perfected enlightened state, and they don’t have the issues of being human anymore. We’re still human. People still like to eat junkfood and smoke cigarettes, and there’s no way I can judge them for that because I have my own problems too! After hanging out for another hour or so, I was ready to leave, so I said my goodbyes and made my way to the car. As I was driving on the freeway, making my way back home, I realized very strongly why it’s recommended that you take the following day off, and spend time resting so you can integrate what you learned from the ceremony. Over the next several hours you may continue to receive “downloads”, and I noticed this happening to me while I was driving, haha. I kept having epiphanies while driving, but I had no way to write it down, so I just did my best to remember it and try to write it in my journal as soon as I get a chance. When I got home, after journaling for a bit, I was super tired, so I went straight to bed. Even here, the spirit of Ayahuasca continued speaking to me. I asked her to stay with me for a long time, and she said she’s here forever. Once you use DMT once, your third eye is open, and you are changed for life. You could perhaps use DMT/Aya every so often, like once a year, to keep it fresh, but once you use it even once her spirit is with you for life. She actually became sort of a spirit guide for me after the experience, and I continued receiving insights from her over he course of the next several months. The ceremony itself may have sounded a bit “boring”, because it was basically just a therapy session, but from my perspective that was EXACTLY what I needed at that state in my journey. Consider this – The life we are experiencing right now, is comparable to sitting in a dark room watching a movie. As long as the lights are turned off, you become so focused on the movie, it starts to seem real. It feels like you’re INSIDE the movie, and you forget you’re just sitting in a theater. That’s how it’s supposed to be. The movie becomes more fun when you feel the emotion, and it seems like it’s YOU experiencing everything you’re seeing on screen. If someone were to walk into the room and suddenly turn the light on, you’d be really upset because you’re suddenly reminded that the movie isn’t real, and you’re just sitting in a theater. This is how life is for most people. Their higher dimensional aspect CHOSE to incarnate an avatar of itself into the 3rd dimension, and intentionally forget that there are higher dimensions. To become “enlightened” is to simply turn the light on in the theater, so to speak, and become aware that there is a life outside of the movie you’re watching – the life you’re experiencing in the 3rd dimension. So as I continued to meditate over the course of the next several months, I started to tune-in more and more with my Higher Self, and I saw that this 3rd dimensional reality is very much like a game or movie that we’re plugged into, just to have a unique experience. After gaining this understanding, I know I still have to live my life as a human, but in some ways it takes a lot of pressure off because I am more aware that I don’t need to take everything so seriously, because no matter what happens, it’s all just a game and after it’s over you just leave the “theater”.